Badan Restorasi Gambut Republik Indonesia - BRG is the Peat Restoration Agency of the Republic of Indonesia. The Agency is a non-structural institution under and responsible to the President. Badan Restorasi Gambut was established on 6 January 2016 through Presidential Regulation No 1 of 2016 on Peat Restoration Agency of the Republic of Indonesia. According to information found in BRG's website as cited by JobsCDC.com, BRG works specifically, systematically, directed, integrated and comprehensive to accelerate recovery and restoration of hydro logical function of damaged peat mainly due to fire and drying. 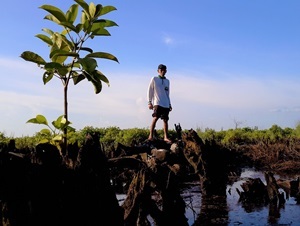 Badan Restorasi Gambut is in charge of coordinating and facilitating peat restoration in 7 provinces: South Sumatra, Riau, Jambi, Central Kalimantan, South Kalimantan, West Kalimantan and Papua. BRG is based in Jakarta and its principal office is registered at Gedung Sekretariat Negara Lantai 2 - Jl Teuku Umar 10, Jakarta Pusat. D3/D4, preferably majoring in Graphic Design, Communication, Visual Communication Design (DKV), Computer. Strong understanding about the management of the web and social media. Skilled in infographic design / lay-out, photo / video editing. Required experience for at least 2 years in the same field. Able to manage activities independently in team. Able to speak English well (oral and written). Good health and well behaved. JobsCDC.com now available on android device. Download now on Google Play here. Please be aware of recruitment fraud. The entire stage of this selection process is free of charge. Badan Restorasi Gambut - D3, S1 Social Media Web Administrator Non CPNS BRG August 2018 will never ask for fees or upfront payments for any purposes during the recruitment process such as transportation and accommodation.